Enchanted Excurse: Learn MORE About Me MONDAY! Learn MORE About Me MONDAY! What is wrong with me? lol This was in 2007, My husband and I just moved here so we didn't have the frame yet for the bed. 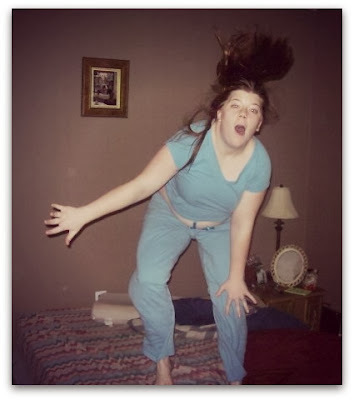 I decided to ask him to take a picture of me jumping on the bed. Yep, welcome to my world!! Also my arms hyper extend? I think that's what you call it. 1.) When I was younger around the age 4 or 5. ( I always seem to remember stuff around this age alot. lol) I had an OCD issue I guess you can call it, where I had to flare my nose until it just felt right. It didn't have to be any certain number, just when it felt like it was just right. I know weird. lol I also did that with blinking and popping my ears by opening my jaw. I just had to do it. I am so happy that I don't do it anymore. 3.) I have always had weak wrists and ankles. Again, when I was younger my ankles would just give out while walking or running. My wrists were so weak that I had to have my Grandma open jars and soda bottles for me. 4.) I was extremely shy that when a teacher would call on me, it would take me about five minutes or more to muster up the courage to talk out loud in class. A lot of times I would just get in trouble for staying quiet. Well, There you go, 5 Things about me that you never knew. lol I'm telling y'all i'm weird. But ya know, weird is fun and interesting!! We should all be weird more often eh? Hope y'all enjoyed reading my post today. :) Would love for y'all to post a loverly comment about yourselves. Ta Ta For Now!! Enchanted Excurse by Robin Melton is licensed under a Creative Commons Attribution-NonCommercial-NoDerivs 3.0 Unported License. Based on a work at http://enchantedexcurse.com/.